On Thursday, I took my new Cameo out of the box and started to make some cuts. I wonder why they added the girl with the pony tail to the "O"? It seems odd when the rest of the design choices are so clean and simple. The machine is well protected with these bulky styrofoam packing pieces. These can be hard to recycle and I would have liked to see the more eco-friendly molded paper pulp packing (just the tree hugger in me talking there!). The mat is clear and thinner than the Cricut mats. 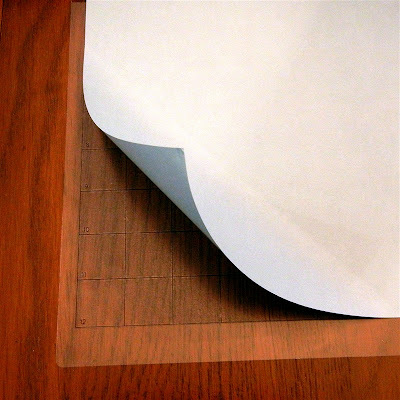 The protective sheet only covers the adhesive area so it can be a little tricky to get it back on perfectly. I had read so much about people having problems with ultra sticky mats that I was a little worried. I just "conditioned" the mat as I do with the Cricut mats by placing my hands on the adhesive and patting it all over. This takes less than a minute but makes the "ultra-hold" stickiness go away. I do like the adhesive - it seems smoother and more even than the adhesive on the Cricut mats. 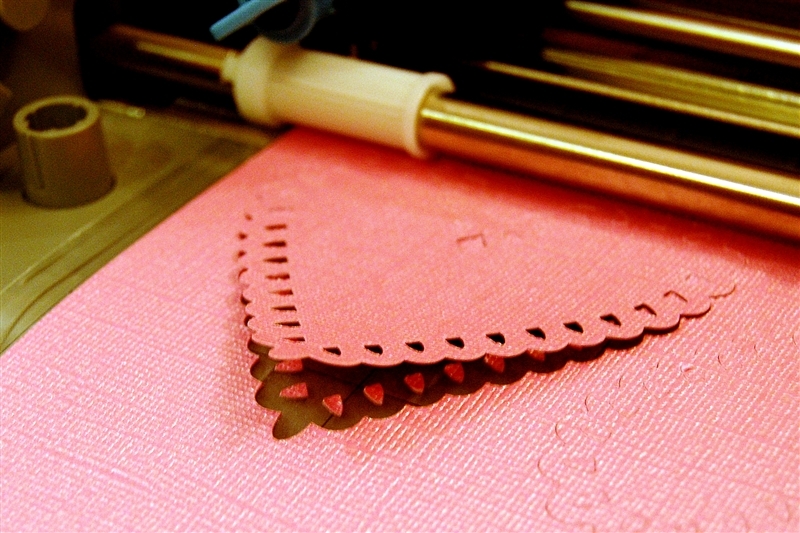 It is more like the adhesive on the Cricut Imagine mats - but stickier. I did not have the problem of little bumps of adhesive coming up on the back of the papers. The blade is already in the "click holder" which is numbered from 1 to 10. You have to use the tool built in on the machine or the plastic tube (on the right) that is packaged with the blade to adjust the setting. You can't change the number without removing the blade holder from the carriage but it is pretty quick and easy to do. I was planning to use Core'dinations Gemstone cardstock which is textured and fairly thick so I tried 5 for the blade setting (the manual said from 4 - 6 for heavy cardstock). 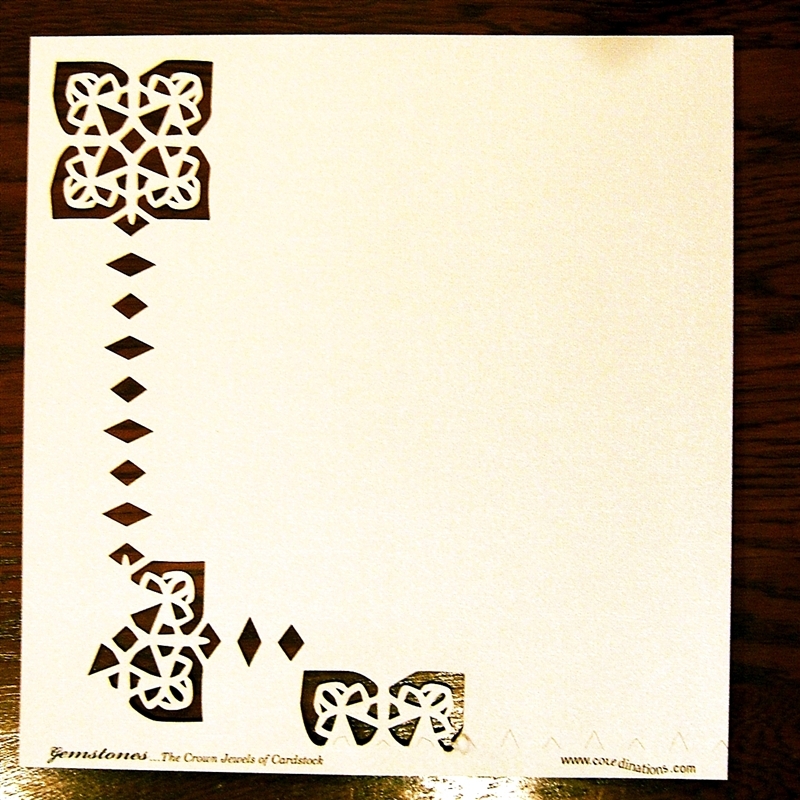 For my first cuts, I tried a couple of the free shapes included in the software. 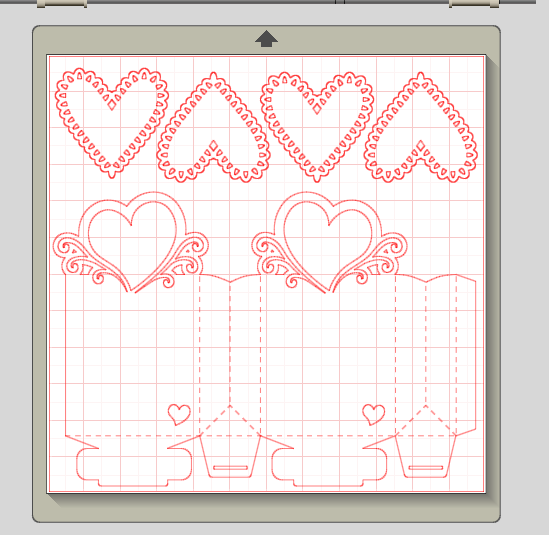 I was able to fit four scalloped hearts across the top of the mat and a cute gift bag on the rest of the paper. 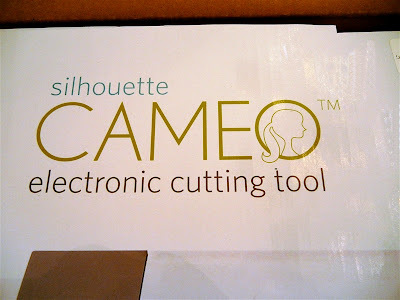 The Cameo will cut to the edge of the 12 x 12 area (there isn't a "no cut zone" like there is with the Cricut). 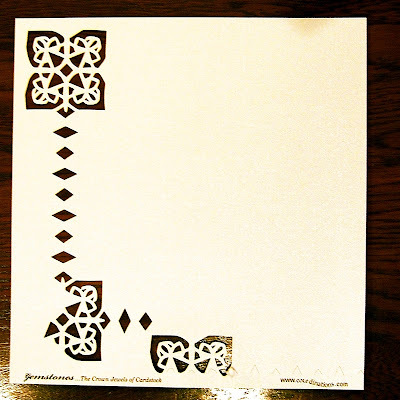 This will be helpful for doing true full page lace cuts. The blade setting turned out to be perfect. My images cut cleanly and the blade did not damage the mat. You could see the outline of the cut in the adhesive but the mat was not cut. 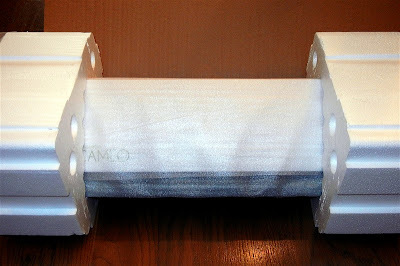 When the cuts are finished, the blade carriage returns to the top left corner. I was able to check the cut before I unloaded the mat. 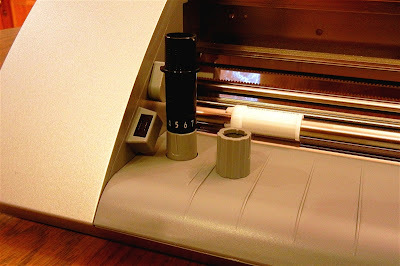 (The Cricut stops at the end of the cut so I usually press "Load Mat" and check the cut before unloading). 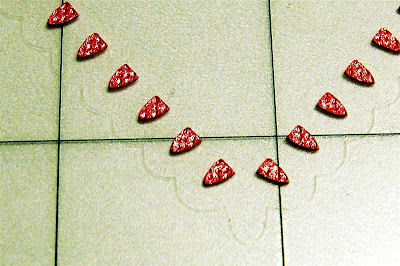 You can see how nicely the heart lifted and all but one or two of the tiny cutouts stayed on the mat. 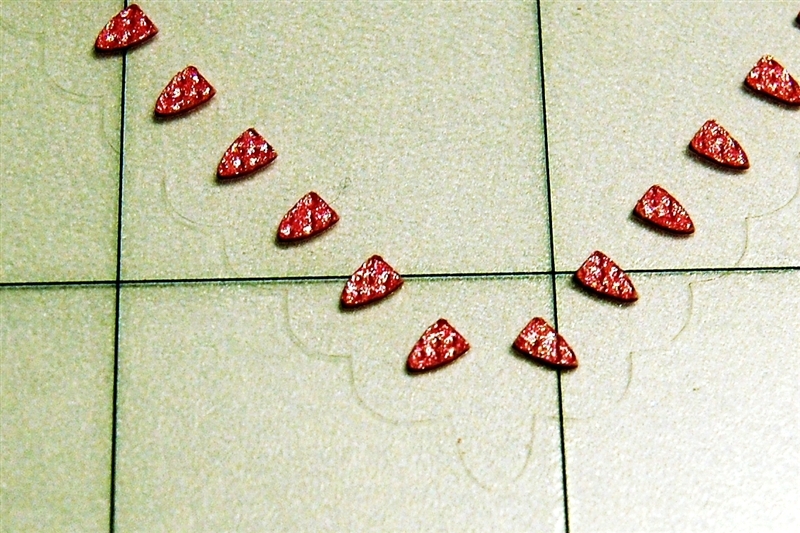 I saved the little bits to use as confetti for a shaker box (if I ever make one!). 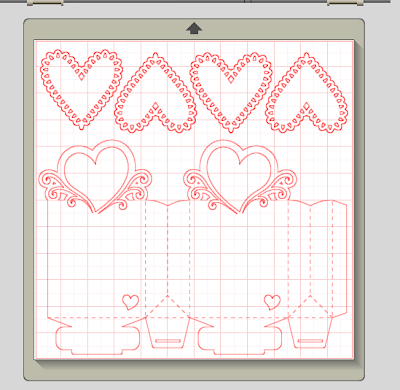 I was able to flip two hearts in the software and align them to make four hearts fit comfortably along the top of the mat. The delicate handles of the gift bag were nicely cut - even with the tiny swirls. The offcut hearts and swirls can be used for a card or tag. I will show you the assembled bag in another post. 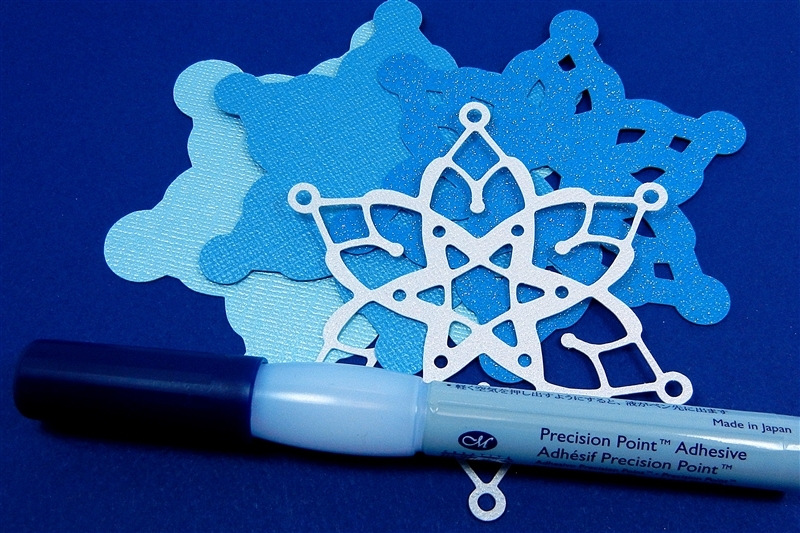 I did try cutting another snowflake that I had designed in the software. 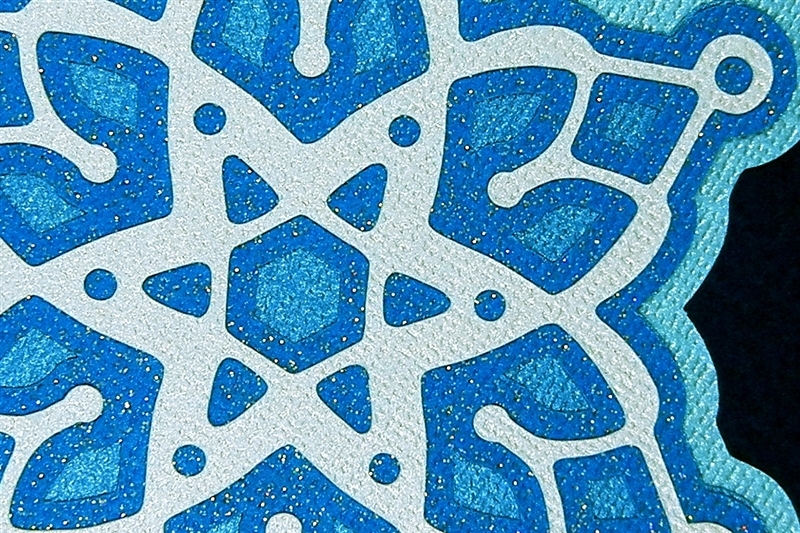 You can see that the circles in the design cut as true circles even thought they are quite tiny. 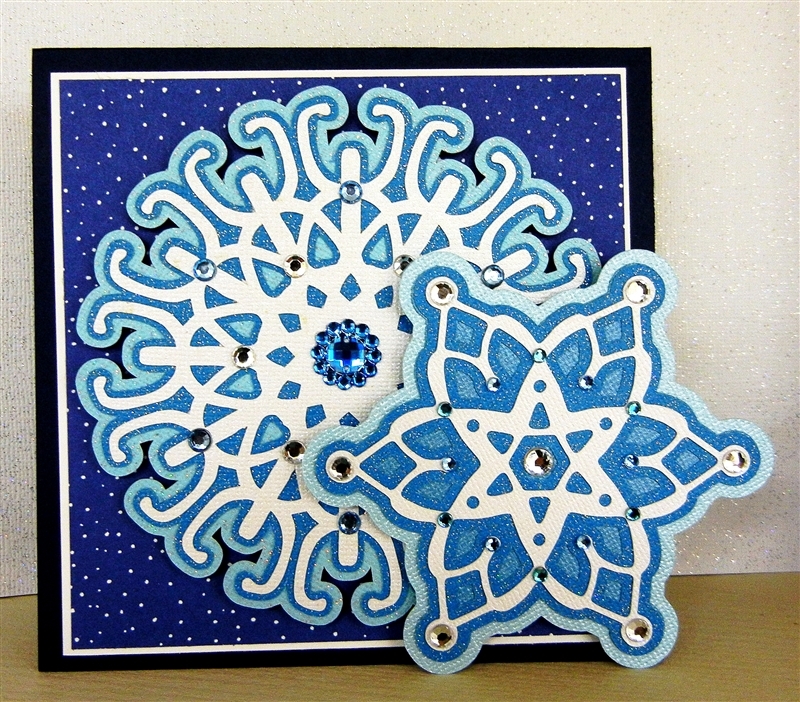 Here is a closer view of the circles in the snowflake design. I tried to cut the intricate frame that I designed (I posted the screen shot at the top of yesterday's post) but the machine just stopped at the third diamond on the bottom row. I tried pressing "cut" again but the machine started at the center of the bottom of the page. I need to do some reading to find out what made this happen. I did simplify the nodes before cutting. 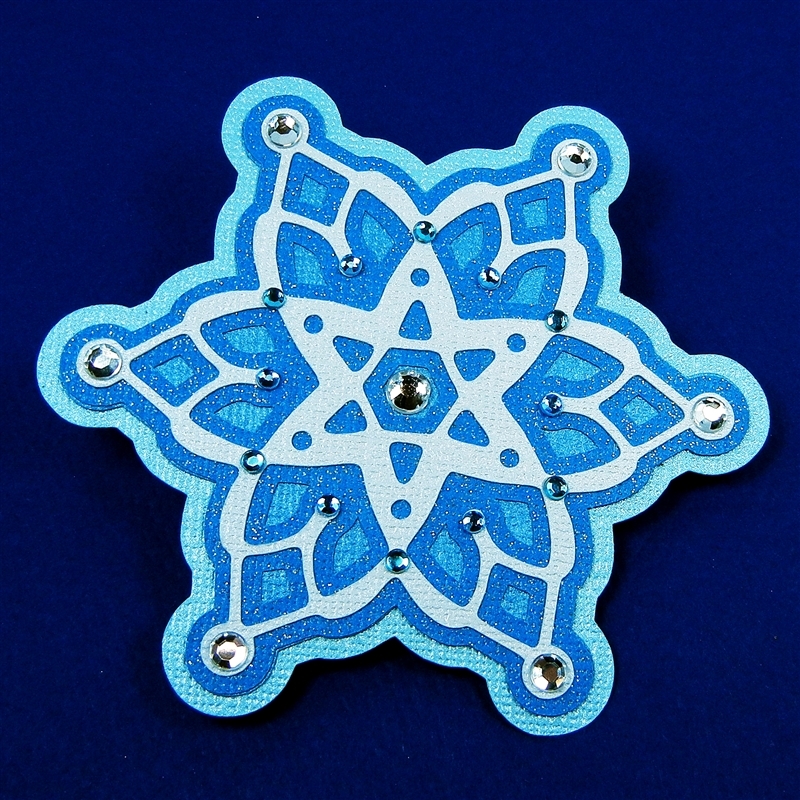 I will try a few other things tomorrow to see if it was a fluke or if I made an error in the design somehow. I had little or no learning curve since I have been using a Silhouette SD (the smaller machine that is now discontinued) since last spring. The main difference was the blade with the numbered settings instead of caps and the larger mat and cutting area. Now that I have this machine, I will probably try to do the advent calendar boxes. They are designed to work for the smaller mat but I think I can revise the design to take advantage of the larger cutting area and simplify the assembly. The machine makes all sorts of funny noises as it cuts. It hums and squeals a bit (just like the SD does). I don't mind the sounds but some people think it is too noisy. It probably would be quieter if I put the lid down while cutting but I like to watch the cuts being made. So far, I am very happy with the clean cuts and easy weeding. I do need to find out what the problem might be with the file that stopped cutting...I'll let you know when I figure that out. Right now, I am just going to admire those tiny circles! Have a wonderful Friday - sometimes the "short weeks" seem longer than the regular weeks so it's nice to know the weekend is almost here. I hope that some of you will be taking on the Color and Pattern Inspiration Challenge I posted a few days ago. I am working on my project and will post it soon to help motivate you. There will also be a small prize for one project that is submitted - details will be added to the original post soon. Very pretty!! I have been debating whether or not to get a cameo and this helps!! Thanks for your post about the Cameo and showing your wonderful projects. I have had my Cameo about two weeks and really love it. The only problem I had right out of the box was reposition the slider for the 12 x 12 mat. It came set at the 13" size and my first cut was all messed up. I find that the slider was extremely difficult to unlock from the bar to move it and have not figured out why. The only way I could move it was to used needle nose pliers to get it out of the slots and then free it up. Love this new machine. I got a Cameo for Chirstmas and I feel a little traitorous (Cricut wise) but your posts have made me feel great about my decision. I can't wait to see what you post next. We will learn together! 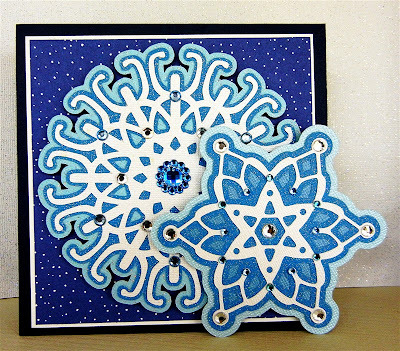 Great snowflake. Enjoy your Cameo. I think they put the ponytail girl in the circle to represent a cameo pin since the machine is called a Cameo. ;) I am hoping to do something with your challenge this weekend. My brain is working! I have found some very helpful tips by looking around the threads. 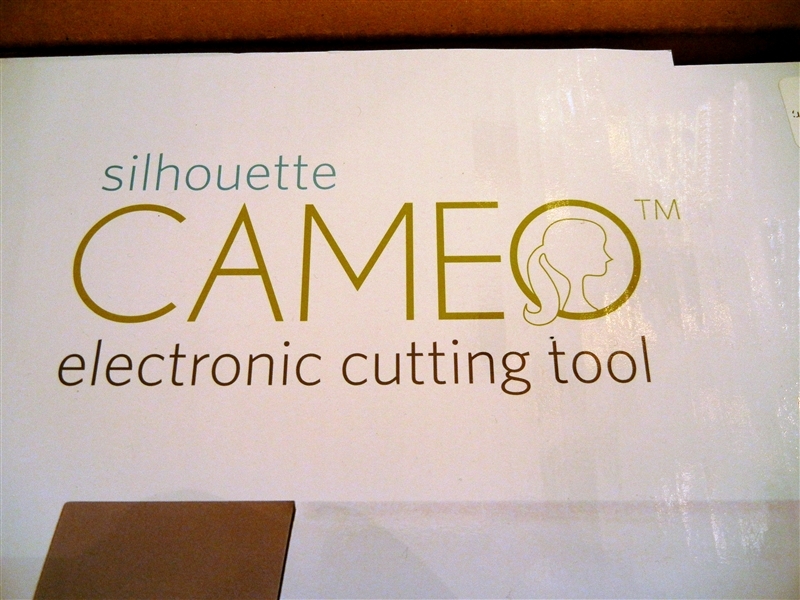 I am glad to hear a good report on the cameo for I do like the silhouette. My cricut has been collecting dust for awhile. Love your small circles. A little snow coming down today here in Maine. Also I did guess right that you got a Cameo. Hi Diane, I am sitting here freaking out because I have spent 3 days, 3 blades two mates and lots of paper trying to cut out the snow flakes from When it is cold outside, Cricut Cartridge. They are great designs but I can not get them to cut. They are just a mess. I tried different sizes, settings, paper. So I need to invest in a Cameo????? Can you help me??? Thanks for all you do. I wish I could call you. I am the person who lives near Madison WI and grew up in PA. Thanks for posting your review! I like to hear how you feel about products as you are always honest and thorough. Thanks for this great post, I love to see what you're doing with the Cameo. I'm going to cut out that cute bag tonight, looks adorable. Thanks to Deb for her tip on another thread to check out. I need all the help I can get! Have a blessed day! 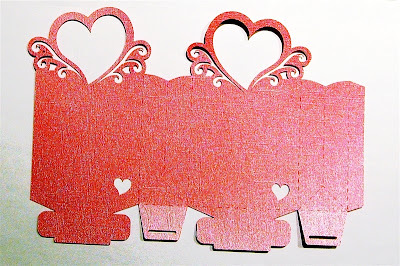 Love this card very cute. So how do you like the Cameo compared to the Cricut.